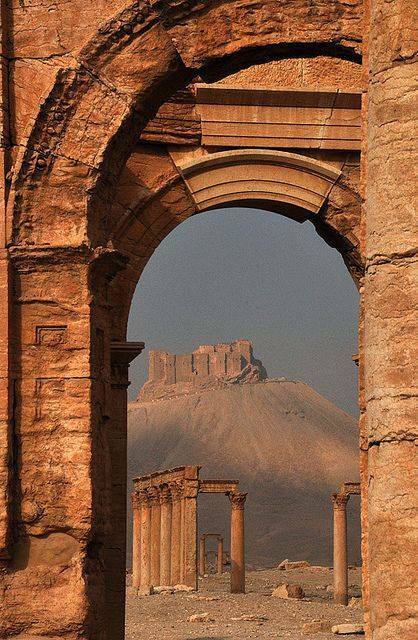 Palmyra, Syria. The erosion of world heritage. There is a pattern to this devastation and there is a vile, destructive reasoning behind it, of that I am certain. Look at all the destruction in Yemen of some of the most beautiful heritage sites, Syria, Libya, Egypt, Iraq and yet look how Saudi Arabia breeds opulence and degenerate, ornate structures…it is as if they are creating the new “heritage” while destroying the ancient footsteps of prophets, writers, designers, artists, intellectuals. Israel and Saudi Arabia are rising like obscene, perverted phoenix from the ashes of this decimation, this wasteland of history. Photo: Palmyra. The NATO Islamic State in Iraq and Syria (ISIS) destroyed large parts of the ancient Temple of Bel, dating back to 32 AD, in the UNESCO-listed archeological city of Palmyra in the central Homs province. September 1, 2015 in Syria.